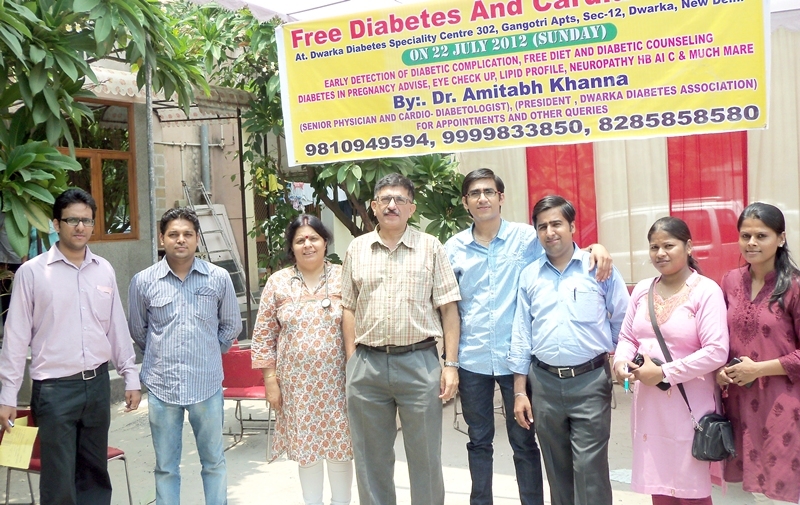 DWARKA DIABETES ASSOCIATION HELD IT’S FIRST MEGA DIABETIC CAMP AT DIABETES SPECIALTY CENTER, flat 302, Gangotri Apartments, Sector -12, Dwarka. Camp was huge success and about 130 people were checked. Blood sugar, Blood pressure, Lipid profile, HBA1c, microalbuinuria tests were done. A diabetic counselling and a dietitian gave free advice to all the patients.10 new diabetes patience were detected. Dr Amitabh Khanna informed Dwarka Parichay that he is are going to organize such camps regularly. Every time there will be some different tests in the camp people can enroll now for the camp in August.